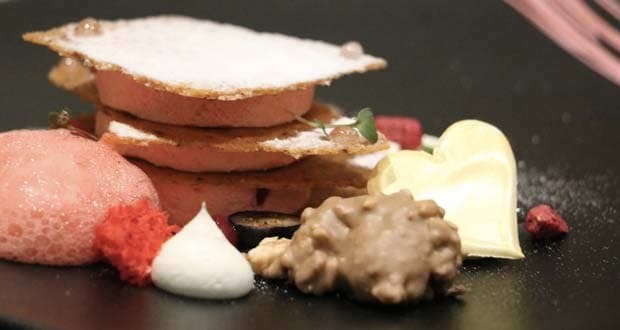 About Rose Berry Valentine Forest Recipe: Spread over a decadent bed of baked rose petal powder, this valentine special dessert is the perfect mix of crunch and sweet with a tang of raspberry. The baked yogurt gives this dessert a creamy plunge along with the perfect rose tint. 1.Cream butter and sugar, add egg white slowly and make a smooth paste. 2.Add flour and rose petal powder, mix well and spread on a parchment paper and bake it in the oven at 180*C for 6 minutes or till it become golden brown colour. 1.Boil the berry puree with sliced berries and vanilla pod, squeeze out the seeds and mix with the puree. Keep aside and allow to cool. 2.Mix the yogurt with condensed milk and cream, make a smooth batter. Add berry mixture in to the batter and mix well. 3.Pour the batter in a laminated tray and bake in the oven on a water bath at 160*C for 20-25 minutes. Allow to cool and keep it in a refrigerator for overnight to set. 1.Warm the berry puree with water, add the sugar and pectin in to the puree. 2.Use a hand blender to beat the mixture to make berry foam. Take out the foam from the top and use for plating. 1.Soak gelatine in the iced water and keep aside, boil the water with vanilla pod, squeezed out the seeds and mix with the water. Add soaked and drained gelatine in to the water. Mix well and dissolve it. 2.Keep the confectioners’ sugar in a mixing bowl and pour the gelatine solution in to the sugar. 3.Beet well with medium speed till it become a soft peak stage. 4.Take out from the mixing bowl and allow to cool. Make it small pieces and coat it with crunchy chocolate and use it in the plating. 1.Melt the chocolate and cocoa butter, mix together and temper it properly. 2.Add the almond crunch and mix well. Keep the temperature 29*C to coat the marshmallows.